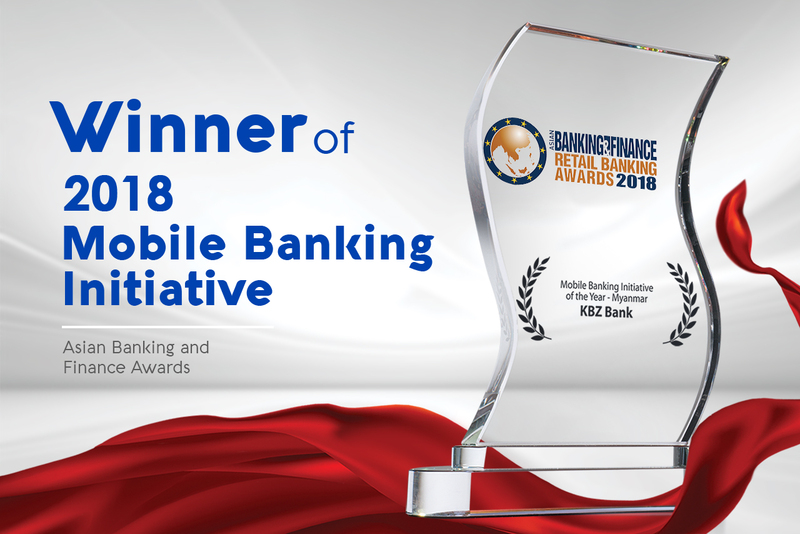 KBZ Bank, Myanmar’s largest privately-owned bank, was awarded the highly sought after ‘Mobile Banking Initiative of the Year — Myanmar’ at the Asian Banking & Finance Retail Banking Awards held in Singapore. The winner was chosen after a stringent selection process by a panel of esteemed and experienced judges. This award celebrates recent mobile banking initiatives by the bank as it strives towards 100% financial inclusion in Myanmar. The bank has embarked on a journey to achieve 100% financial inclusion in Myanmar and believes that the future of banking lies beyond the branch doors. “Mobile banking allows us to reach pockets of the population that previously did not have access to financial services. Being innovative and transformative have allowed us to connect with these people, and we will continue doing so in order to become the bank that Myanmar needs and deserves”, added Robin Chua, Senior GM of Transactional Banking at KBZ Bank. 1) Function: Domestic cash remittances, widely used among locals, was identified as an area of focus for the bank. Identifying an opportunity to simplify this process through mobile banking, KBZ introduced Remit2U and Cardless ATM Withdrawals. Remit2U, the first of its kind in the country, allows users to send money to a beneficiary through the KBZ mobile banking app. By visiting the nearest KBZ Branch and presenting his/her NRIC and SMS code, recipients can easily receive their money. With Cardless ATM Withdrawal, recipients can withdraw cash at any KBZ Bank ATM without their ATM card by using the code sent via text from KBZ Bank as well as a code provided by the person who transferred the money. 2) Customer Journey: Guided by the principles of simplicity and ease of use, KBZ Bank focused on improving the customer journey for our mobile banking user interface by introducing a new user interface: ‘So Simple So Easy’. Mobile banking with KBZ Bank is now available in two languages – Myanmar language and English. Icons, displays, and features have been modernized and simplified, ensuring only necessary information is presented to the user, offering a seamless and convenient mobile banking experience. 3) Security: KBZ Bank was among the first few banks in Myanmar to introduce Software Tokens as an alternative to Hardware Tokens. This is part of our commitment to safe and secure internet and mobile banking through two-factor authentication. Software Token has allowed the bank to improve both customer experience with faster turnarounds, and lower logistic costs. Currently, more than 40% of the bank’s new corporate customers are using Software Tokens. “We keep the customer in mind for everything we do at KBZ Bank and are heartened to see the significant increase in the adoption of our mobile banking services over the past 12 months. We understand what our customers want and will work towards continuously meeting and exceeding their needs,” added Mr. Chua.